This favourite photograph shows a group aboard the Heathcote’s coach, “Defiance”. They look ready for the off! 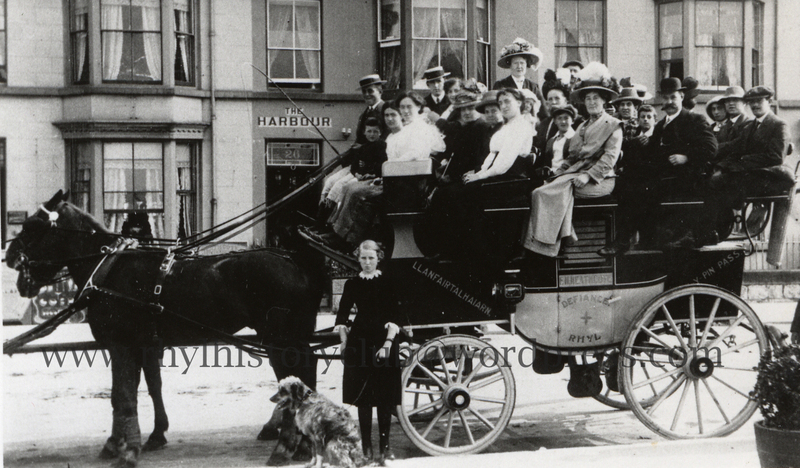 Destinations are inscribed on the coach – the two we can see are Llanfairtalhaiarn and Bryn y Pin Pass, but we’re not sure where this particular group were going. The date of the photo is also unknown although we know it was before 1909 because it was in that year that bankruptcy proceedings were filed against coach and carriage proprietors Messrs. John and Francis Heathcote. In 1909 the local press reported on the auction of coaches, char-a-bancs and vehicles of all descriptions, harness, saddlery and clothing used in conjunction with the business carried out by J. and F. Heathcote for many years at Victoria Mews, Rhyl. (Does anyone know where Victoria Mews were?) Among the prices realised were: “Enterprise Coach” £94-10s., “Defiance Coach” (pictured above) 52 guineas, “Tally Ho” Coach 56 guineas, “Tourist Coach” 42 guineas, and the Station Bus £81-18s. 34 horses realised the sum of £1,095-13s-6d. “I wonder if a tenth of those who visit Rhyl year after year have any idea of the really magnificent drives there are within a short radius of the town or, indeed, if the great bulk of the residents have. For many years char-a-banc and brake journeys were confined to the regular runs to the Marble Church, St Asaph, Cefn Caves, Dyserth Waterfalls, and so on and beautiful drives they are. But a few seasons ago carriage proprietors seemed to have been seized by greater enterprise. Coaches were added to the stage conveyances previously in use, and the scope of operation considerably widened. This week I was enabled to enjoy one of these extended tours on a coach. I selected the coach of Mr Peter Edge, the one with piebald leaders (and a rattling team it is), and our destination was Llanfairtalhaiarn-that lovely spot in the Vale of Elwy. To adequately describe the charms of the country through which we passed is beyond me. We had a glorious day, and a prompt start was made. Voryd (sic) bridge was soon cleared, and to our left a fine vista of the Vale of Clwyd presented itself, embracing views of Rhuddlan Castle, St Asaph Cathedral, the Marble Church, Kinmel Park and Mansion, and almost in front we could see the castellated residence of the Countess of Dundonald nestling in the woody slopes of the Gwrych domains. After a short breathing time and a drink (for the horses, of course) at Abergele, we were off again, up the hills this time. Higher and higher we got at a fair pace through pastoral scenes of absolute sublimity. Tyddyn Isaf loomed on our left, and to the right stretched a landscape of surpassing loveliness. About three miles out of Abergele the highest point in the climb is reached, and then we go downhill for about a mile and a half to Llanfair, the valley of Elwy spreading out in charming panorama in front, and the bubbling stream from which the vale takes its name wandering along its winding course through luxuriant meadows. What a glorious prospect, what diversity of scenery laid before us. Well, it must be seen to be appreciated. It is needless to say that all the party enjoyed the tea served out at the Black Lion Hotel, that little hostelry so beloved of anglers, those selfish beings who would if they could keep out all intruders (as they are pleased to call all who are votaries of the gentle art). Of course there are other places of entertainment for man and beast in the place, (there is the Swan for instance), so no visitor need fear being “crowded out,” as I am afraid this scribble will be unless it is cut short right here. there was any number of odd buildings at the rear of the High Street (the old White Rose Garage yard). I cannot claim all the credit for this Colin Jones @Rhyl Life has posted a photo showing the Victoria Buildings, I had a think then thought may be.